Alan Rich, "the dean of American classical-music criticism" (Alex Ross, author of The Rest is Noise) has died, aged eighty-five. He was the last critic to have heard Artur Schnabel perform. As a student at Harvard, he was a member of the audience at the first performance of Bartok’s Concerto for Orchestra in 1944 and went backstage afterwards to shake the composer’s hand. He was also among the surviving auditors of the Paris Opera’s legendary 1955 production of Rameau's Les Indes Gallantes, complete with shipwreck. (I was there as well, but on a different night). Alan, a llowed by Nicolas Slonimsky to write his own entry in Baker’s Biographical Dictionary of Musicians, described himself as “having an uncommonly bellicose disposition tempered by prejudice towards favorites.” Bellicose indeed! Virgil Thomson, a fellow-critic for The New York Times, called him “our only musical muckraker.” As Music Director at KPFA in Berkeley in the 1950s, his scathing dismissal of the San Francisco Symphony’s new conductor, Enrique Jorda [left], chosen to replace the great Pierre Monteux, brought pressure – from the Zellerbach dynasty, no less! – on Lewis Hill, the station’s manager to ask him to moderate his reviews. 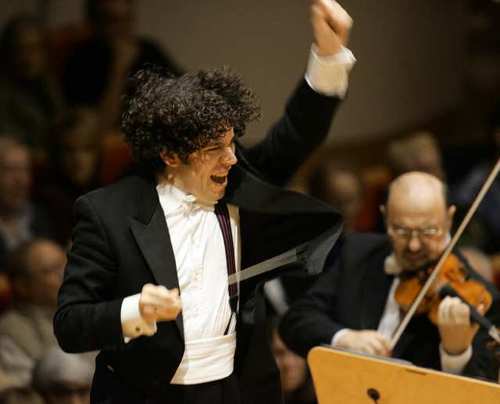 Alan’s ire had been aroused by the fact that the orchestral management, having gone through a Season of Discovery, followed by a Season of Decision, had made a choice that Alan thought was due not so much to Jorda’s baton technique as to his hand-kissing (to put it politely). The next season, he told me, would be the Season of Regret. Newsweek would send me anywhere, no expenses spared, but I was lucky if I got space in print every other week. The Herald Examiner pays peanuts, but [and he thumped his chest for emphasis] they print every word I write! When the paper folded in 1998 (as his publishers had a way of doing), he went over to the L.A. Weekly, where he remained until ten years later when he was fired in a mean-spirited economy move. David Weiner promptly set him up in an online blog, www.soiveheard.com, which survives him with an enormous collection of his writing going back to 1983. Alan belonged to that small but seminal band of American music reviewers who do not merely pontificate, but who work behind the scenes to support important new composers and performers in a country where such backing has always been thin on the ground. This impulse took root and blossomed in his early post graduate years in Berkeley, when he was simultaneously a teaching assistant in the U.C. Music Department and, from 1953, Music Director at Berkeley’s newly formed and pioneering FM station, KPFA. At the University he studied with such musicological giants as Joseph Kerman, Manfred Bukofzer and Otto Erich Deutsch. Alan was a natural teacher with a first-rate mind and memory; a passion for the new, the original and the excellent; and a missionary zeal to share his discoveries with the widest possible audience. It made him so popular with the students that faculty jealousy was rumoured to have played a role in the ultimate rejection of his PhD dissertation. Whatever the cause, the termination of his academic career shifted him totally into radio. His mentor at KPFA was the composer Robert Erickson [right]. To Bob [Alan told me in a conversation in 1994] I owe a great deal of my take on the whole musical world. We had long conversations, we spent a lot of time in the studio playing Haydn quartets four hands – it was practically a whole extracurricular musical education. And through Bob I got to develop a much closer identity with the contemporary scene. 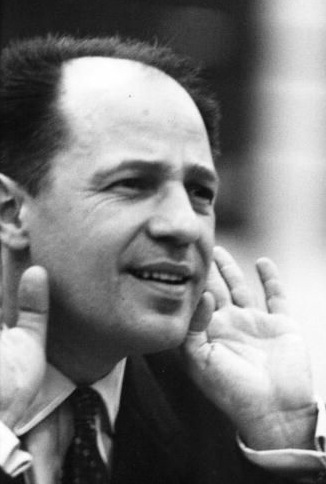 One memorable programme came about in 1957 as a result of Alan’s being invited over to San Francisco for a dinner party at which the guest of honour was a 32-year-old French composer named Pierre Boulez [left]. Says Alan:. In 1957 I became friendly with a man in San Francisco who was putting up a lot of money for contemporary music concerts by the name of Hans Popper. He invited me over one night to a dinner party that he was throwing for a recently arrived friend of his by the name of Pierre Boulez. Boulez played music that I had never heard and never heard of, including his own Le marteau sans maître and Stockhausen's Song of the Holy Children. I said, “We’ve got to have this on KPFA,” so I talked Boulez into coming over the next morning or the morning after and submitting to a panel discussion. I got on the phone and feverishly rounded up Bob [Robert Erickson], Andrew Imbrie, Arnold Elston and Jack Holloway. We had a lively forty-five minutes in the studio, with Imbrie attacking Boulez on almost any front. This interview [click to listen] was typical of KPFA leading the taste of San Francisco toward an awareness of what was going on in the contemporary world. One lives for moments like that. Bob Erickson knew that Alan’s principal interest was in criticism, and so he set him up with a fifteen minute weekly commentary, in the course of which, as well as promoting the best of the Bay Area’s musical events, he made more enemies than an Agatha Christie corpse. In 1960 he was asked to help launch WBAI, KPFA’s new sister station in New York, and in less than a year he had landed a job as one of five music critics on the N.Y. Times. His special responsibilities lay in the area of new music, and in an interview back at KPFA in 1962 he spoke at length about the problems of producing and promoting it. The rest of his career would be based in New York and then in Los Angeles, the two urban centres in which new music was most often performed. The reason for this, Alan explained, was the availability in both of “first-rate free lance musicians with a tremendous ability to sight read”. Alan moved over to the New York Herald Tribune in 1963, where he stayed until it folded in 1968. Its Sunday magazine, New York, survived and began an independent existence under Clay Felker, with Alan as a founder member and music critic, where he stayed until 1981. He returned to California, this time to the Los Angles area where he wrote first for California magazine, then Newsweek, then The Los Angeles Herald Examiner and finally the L.A. Weekly. for the fact that [Los Angeles] is the liveliest music center in the country, both in terms of a very progressive attitude toward performances and toward new music. 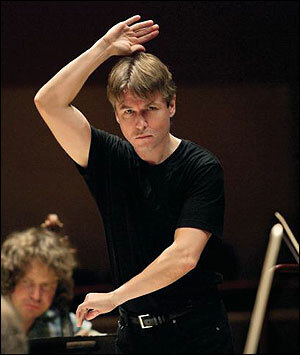 By 1997 Esa-Pekka Salonen had made the Los Angeles Philharmonic relevant, to its city and to the possibility of a future for classical music in a community. The acumen of management, in nailing down this phenomenal young musician from the grasp of an avid competition, has now been crowned. Virtually every fellow-reviewer who has written about Alan since his death claims to have been at some point a victim of his intemperate and undeserved criticism. These episodes usually resulted from Alan’s violent disapproval of that critic’s musical judgement. Music was virtually a religion to him, and his anger was most easily aroused by anyone he felt had been undeservedly tolerant of mediocrity. He cut me dead two years ago . . . he didn't answer my last letter from KPFA . . . he told me off for writing too critical a review . . .
Alan Rich’s books include: Music, Mirror of the Arts, 1969; The Simon and Schuster Listener's Guide to Opera, 1980; American Pioneers (20th-Century Composers), 1995; So I've Heard: Notes From a Migratory Music Critic, 2006 and Play by Play, a series of books with accompanying interactive CDs. If music critics were to be granted posthumous pedestals, Alan would occupy his as easily, as happily and as deservedly as any of his contemporaries. A shorter version was published in The [London] Guardian.